During their pregnancy, dogs go through the same highs and lows pregnant women go through. Their hormones are raging and their bodies undergo drastic changes. 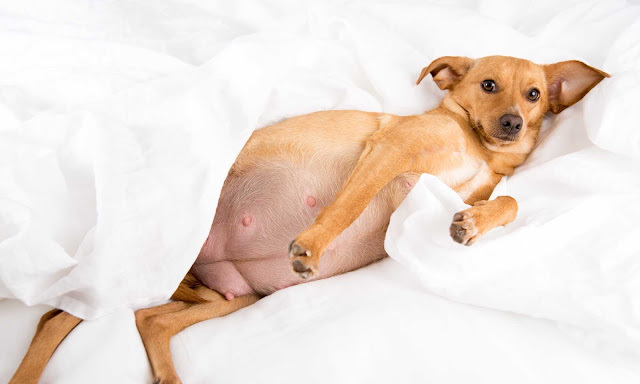 Like pregnant women, pregnant dogs should be given the same care and attention - proper diet, vitamins, and exercises. Unsupervised dog pregnancy might lead to complications or even a miscarriage. If you are not an experienced dog breeder, then doing a little research caring for a pregnant dog might be of some use to you. During your research, you could also come across helpful information that would help you care for your pregnant dog better. Sometimes, it can be hard to tell if your dog is pregnant. The surest way to confirm if your dog is pregnant is to take her to a licensed veterinarian. Just by looking at your dog's abdomen and feeling it will alert the vet to the presence of growing pups. The vet can also estimate the due date of the pregnancy. Knowing when your dog is going to give birth to her puppies can help you prepare for the event. Knowing when your dog is going deliver her puppies gives you ample time to prepare clean towels just for the event and to choose a place where your dog is going to whelp her puppies. As the event draws near, it is time to isolate your dog from other canines in the neighborhood or in your household. This is to prevent your dog from catching the herpes virus that is deadly for her puppies. Nutrition: Though nature will take its course, your dog needs your attention and support during the birthing. She might go to her favorite spot, usually a cool dark place, where she can bring forth her "babies" privately. In the meantime, that she is on her way to motherhood, you play an important role as her caregiver. Your dog's pregnancy will last for about three months - a little bit more or less. During this time, she should be fed properly. She should be given less fatty foods and more organic and chemical-free foods and vitamins. Your veterinarian can provide you a list of healthy dog food for your pregnant dog. Her weight should be monitored if she is gaining the expected weight for pregnant dogs. Exercise:Regular exercise is also a must in caring for a pregnant dog. During the early stages of pregnancy, regular or daily walks for the dog is strongly advised. However, in the final twenty days of pregnancy, strenuous exercise and outdoor exposure should be avoided. Vaccination: Vaccination should also be avoided during pregnancy. Vaccination is allowed just before the breeding process. Her immunity will be passed on to the pups through lactation. If your dog is already on an on-going medication prior to pregnancy then you should definitely check with your veterinarian if it is safe to go on with the medication. Although most dog medicines are said to be safe during pregnancy, it is still wise to check first with a professional. Another important thing you should be preparing for is where your dog is going to give birth. A large box big enough for your dog and her future puppies would do nicely. Make sure to line the box with newspapers and old towels for it is sure going to be messy when your dog gives birth to her pups. The newborn puppies should be staying in the box with their mum until they are about six weeks old, so make sure that it is durable and cozy enough for them.